The head of the International Island Games Association has given Jersey's venues its approval, on a visit ahead of the 2015 Games. A committee from the association has visited the island to inspect the facilities. About 3,000 sportsmen and women are expected to compete, in sports such as golf, beach volleyball and archery. 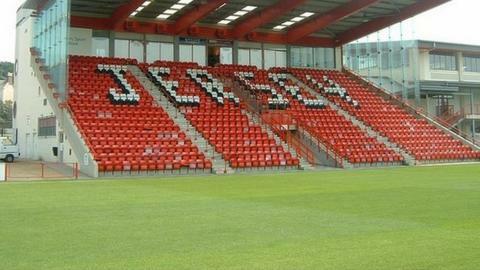 "It's perfect - the organisation is in very good hands," IIGA chairman Jorgen Pettersson told BBC Radio Jersey. "We've seen professionalism, we've seen venues that are already ready to get used and we've seen plans for investment in venues in order to have them ready for next summer. "We have the most confidence in [Jersey 2015 organiser] Phil Austin and his crew." Venues including Springfield Stadium, the Geoff Reed Table Tennis Centre and Caesarean Tennis Club are amongst those set to stage the action. All 24 member islands have indicated they will send squads to the Games, which looks like being the biggest in the event's three-decade history. Organisers are still to confirm the location of the opening and closing ceremonies as well as the Games village but have revealed on the outskirts of St Helier. It was among the places visited by the IIAG committee on Thursday. "It's very important to have a social meeting place during the evenings," added Pettersson. "We want them to come here as sports people representing their islands but we want them to go home as friends and international citizens. "I stress the importance of a Games village, whether it's going to be in the park or wherever, that's an operational thing for the host island but I have to say the park that you have here is phenomenal." The Natwest Island Games will run from Saturday 27 June to Friday 3 July 2015.